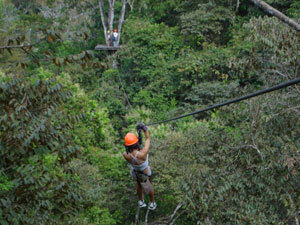 The Montezuma Waterfall Canopy Tour is one of the zone�s premier attractions. The canopy consists of a series of nine cables and eleven platforms suspended high above the forest floor. The guests glide along the cables using a pully and a breaking device. Our local, English speaking guides are experienced and are trained in First Aid to ensure that this tour is safe and easy for all visitors. While on the canopy tour you will see a number of plants and animals unique to Costa Rica, possibly including howler and white-faced monkeys, parrots, and iguanas. The course follows the Montezuma river and gives you an opportunity to visit the famous waterfalls where you can take pictures and go for a swim in the pools carved by the cascading waters. This is an experience that should not be missed. Swim suit, sun protection, hat, sunglasses, and closed shoes.